Explainer: why are countries vying for a piece of Mars? (Nanowerk News) The red planet is about to welcome a new visitor: India’s Mars Orbiter Mission (MOM) is hoping to start orbiting Mars on September 24. MOM is not the only new kid in town. The American MAVEN explorer arrived at the planet on September 21. This means there are currently five operational spacecraft orbiting Mars and two rovers on its surface. China, Japan, Russia, the US and joint European countries have all tried to send missions to Mars before India. What is it about our rocky neighbour that makes it such a focus of interest? The past 25 years have seen an enormous increase in our understanding of Mars, based on the results from space missions both in orbit around the planet and on the rocky surface. All but one of the missions has been led by the US National Aeronautics and Space Administration (NASA). 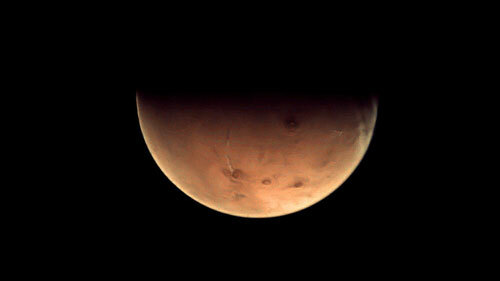 The exception is the Mars Express orbiter managed by the European Space Agency (ESA). All of the spacecraft have returned spectacular images of volcanoes, dried river valleys and deep chasms – more extreme examples of features common on Earth. Complementing the images have been data which identify the composition of rocks seen from above, including the layers of clay which pick out where water has flowed. Although all the operations have had specific goals in terms of understanding the geology of the planet, mission scientists have one, sometimes unspoken, aspiration: will this be the mission which detects signs of life? The raised hopes, arguments and dashed expectations of the 1977 Viking Life Detection experiments are still too fresh. NASA’s twin Viking landers each carried instruments designed to test the chemistry of Mars' soil, in order to determine whether there were any molecules present which could be the product of biological processes, rather than of non-living chemistry. Sadly, interpretation at the time of the results was inconclusive. As our knowledge of Mars’ surface science has increased, along with a better understanding of the effects of solar radiation on organic molecules, it has become apparent that the Viking experiments, although the state-of-the-art of the time, would not have been able to detect a biological signal. Ten years ago, ESA’s Mars Express recorded enhanced levels of methane in Mars' atmosphere. The amount of methane present might have had several origins – the most exciting of which would have been from a biological source. Sadly, like the Viking results, the Mars Express findings were, at best, ambiguous – and subsequent measurements from ground-based telescopes have been equally problematic. NASA’s Curiosity rover, which has just arrived at the foot of Mount Sharp in the Gale Crater on Mars, has also failed to detect methane in the atmosphere at ground level. MOM and MAVEN both carry instruments designed to investigate the atmosphere of Mars. If they detect Mars' missing methane then the debate about life on Mars will be re-ignited. Although MOM is carrying several instruments, it is not predominantly a scientific mission. It is a technology mission, to test India’s ability to undertake interplanetary exploration. Even before any science is carried out, Indian space scientists can celebrate that their mission has succeeded: launch, Earth escape and cruise were flawless. Chandrayaan, India’s successful lunar mission in 2008 was the country’s triumphant entrance into space exploration. Mangalyaan, as MOM is known informally, is a follow-up, that places India as a significant player in the space exploration club.